My Twitter friend Celia Soudry who blogs about food for the LA Weekly was twittering yesterday about how some people earn money in these tough times. A lot of this involves "sleep studies" where she reports one can make 9k a month (if one qualifies) letting themselves be experimented upon. I don't think I could take people randomly waking me and flipping lights off and on to see what effect it had, but there's one person I'd gladly let experiment on me any old time and that's Paula Wolfert. When Paula asked us to come to lunch yesterday so that she could test a recipe from her upcoming cookbook, we were totally stoked. I love going to any meal at Paulas' house and she can experiment on me any old time she likes. That morning she'd twittered me and asked what we wanted to drink. I don't drink, and since at most Indian meals I serve beer, I know beyond next to nothing about wine. Even though we have quite a nice wine collection which Alan enjoys when we have friends to dinner, I was at a loss. I didn't know what to pull. So I sent out a Twitter flare to Tuscan chef Aurelio Barratini and he tweeted back that a nice young, dry white would work well with shellfish couscous which was what Paula was making. I twittered back to Aurelio, asking what young and dry meant, but Aurelio was gone. I consulted The Google and a couple of good wine websites and pulled the appropriate bottle. Thank God for Twitter! We arrived at Paulas' place to find her busy in the kitchen cooking up a storm. The big copper cous-couserie was out and there was a mound of corn grit couscous in a large wooden bowl. She invited me to feel the texture. It was light and fluffy and ready for the final step of cooking. While Paula's husband Bill Bayer, and Alan and our friend Charles discussed Larry David's Curb Your Enthusiasm and how life imitates art...Paula was giving me a guided tour of our lunch. I sampled sauces, learned about a nifty way to do fish stock and then she whipped out a small bottle of what appeared to be olive oil. "Taste!" she said. I knew she was up to something. "What sort of oil is this?" I asked. "Kind of hazel-nutty. Interesting. Where's it from?" She took the bottle back. "Guess"
Now when someone asks me to guess what they're feeding me, I know that something is up. It's either not what I think it is or it's been obtained in some fairly "interesting" way. My mind was racing through a catalogue of food stories, and rumors I'd read and heard. "Does this have something to do with.... poop?" Yes, it did as a matter of fact. I'd had my first taste of Argan oil. Yes, those are goats in that tree eating the Argan fruit. How they get up there, who the hell knows. What they can't "use" we do. Enough said. "Don't tell Alan" she said. I wouldn't think of it, though I wondered what Larry David would do with the information. The stuff is delicious by the way, and waaaay out of my typical grocery shopping price range. I watched as she finished off the shell fish quickly. The deep pan in the center is Flameware made by the people at Clay Coyote. It is an amazingly sturdy substance. A deep, wide clay pan that doesn't need to be pre-seasoned and can believe it or not, go right on a direct flame...ergo the name! I have one of their casseroles and it makes perfect risotto and polenta with no work at all. Paula gave me one of these pans yesterday and I can't wait to use it in some of my recipes that call for a kadhai. And brought to the table. This is a Berber dish and will be in her new cookbook. In the center are the corn grit couscous, surrounded by jumbo shrimp, squid, mussels, baby turnips cooked with their greens, and a sweet sultana raisin and onion sauce, very chutney-like in texture. Drizzled with sauce, it was light, fresh tasting and delicious. I also discovered that Alan loves mussels. At least he loves them when Paula cooks them, and who could blame him. It was a delightful afternoon with good friends, good conversation, good wine (thanks Aurelio) and even greater food. Paula's next project is going to be snails. It seems there is a Moroccan soup that is made of snail broth. Paula needs snails! She has sent out word via her good friend Sonoma Index Tribune Food Editor Kathleen Hill and through her, The Great Sonoma Snail Harvest is ON! Paula has very specific instructions as to how we Sonomans are to gather the snails from our vineyards, gardens and lawns. There is a drop off spot. Then the experiment begins. I have never ever in my life eaten snails. People who have, tell me they're delicious. So we shall see how far I am willing to go in the name of food experiments. Boy, are you ever lucky! I'm a huge fan of Paula's! Her cookbooks are priceless. I know! And this new one is gong to be great. First off I have a crush on Larry David. Not only did you have lunch at my number one cooking idols house but what you ate looks like my favorite food in the whole world. It is no FAIR, I want to be YOU. A NEW BOOK!!! REALLY? I NEED IT NOW!!!!! Not only THAT but did anyone ever tell you that you write a mean blog post. You poop. Such a good experience. And look at all the food and special ingredients you get to try. What a fantastic post. I have never heard of argan oil, but I am going to google it now. I am intrigued. The cookware that you mentions was completely foreign to me. I love hearing about new things and finding ways to incorporate them in my life. Paula is quite an adventurous woman, I wish I was closer to Sonoma. I have tons of snails in my garden. My dog Feta is quite the accomplished hunter! Oh my goodness! That looks absolutely divine! we always have a great time when we eat at Paulas' house. me too, I'd never heard of argan oil but it was good. Paula and I were talking yesterday and she told me she is rapidly becoming the snail queen of Sonoma! you and me both. I used to see him around our neighborhood all the time when we lived in LA (Santa Monica). We're constantly having experiences that we call Larry David moments. What a great post and a fun read. I've heard of the oil, and of course of Paula but everything together was just grand! now you know how I felt watching you cruise the kitchens of Mitteleurope. Paula says I need to wear more red. What fun! And how delicious. I am so jealous. How absolutely fun! Looks like a memorable lunch. I really like the idea of corn grit couscous, especially if it's made without wheat flour. Perfect for serving those who don't eat gluten. 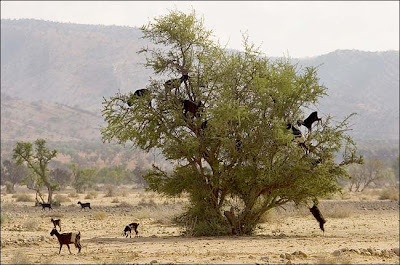 The picture of the goat tree is hilarious.